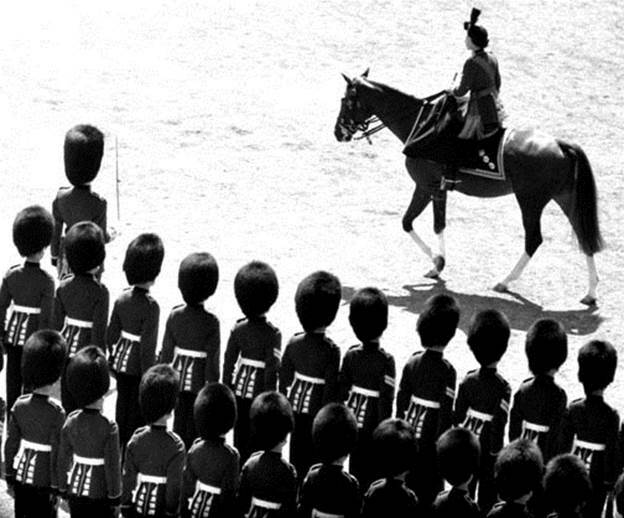 London, June, 1959: Palace guards stand at attention as Queen Elizabeth II rides past during a Trooping the Colors ceremony marking the queen's 33rd birthday. The event had a scary moment when a cavalryman's horse became frightened and bolted toward the nearby monarch. According to a wire service story, "the queen just looked straight ahead. Not a royal eyelid blinked as the cavalryman quieted his mount, got back into line and the parade went on according to plan."